The recession is not a barrier to entrepreneurs it's a welcome mat - that was the message from world expert, Dr Stephen Spinelli, to University of Ulster students and small business owners this week. He is on a three-day visit to Northern Ireland organised by Ulster Business School’s Professor of Marketing, Mark Durkin. Dr Spinelli, a successful entrepreneur in his own right, will also give an inspirational talk on entrepreneurship tomorrow to 'Work West Enterprise Agency' in West Belfast - an area of high social deprivation. The President of the University of Philadelphia says there are always opportunities for people with good ideas. "As long as there are problems in the world then there are solutions and once you think of the solution that can be turned into a good business idea," said Dr Spinelli. "No matter what group of people I'm talking to essentially the message is the same. Even if you have nothing - and I started off with nothing - resources will eventually be attracted to you if pursue an idea with enough vigour. "During a recession people are paralysed with fear but an economic downturn presents new problems and therefore new solutions - it's a welcome mat for entrepreneurs." 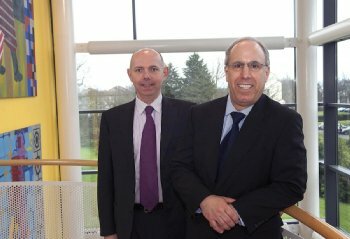 Caption: Professor Mark Durkin and Dr Stephen Spinelli.